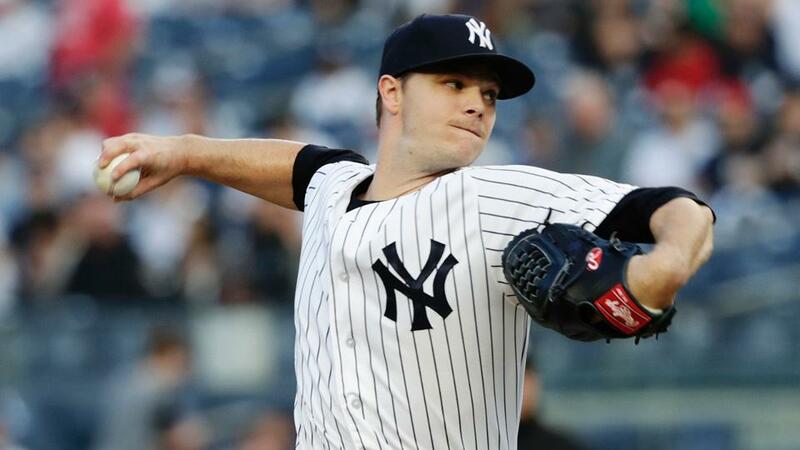 If it wasn’t already likely that the Sonny Gray era in the Bronx was nearing an end, Yankees general manager Brian Cashman made it explicitly clear on Monday. Remember that this is coming from the GM of a team that badly needs starting pitching, because the Yanks at this point can only count on Luis Severino and Masahiro Tanaka to be in their 2019 rotation, though CC Sabathia looks to be joining them. “I’m interested in adding more than one pitcher,” Cashman said on Monday. Despite that, Gray will be on the move. That said, it hasn’t been that long since Gray was a highly touted young pitcher, and he’s still only turning 29 this week. When a quality pitcher collapses, the first thing you want to find is what went differently. Immediately, you think of velocity, but there’s not much to that in this case. In 2014, Gray’s first full season, his four-seamer averaged 93.8 mph and his sinker averaged 93.6 mph. In ’18, those pitches averaged 93.6 mph and 93 mph, respectively. While there’s been some minor fluctuation in between, velocity isn’t the issue. One thing that has changed is pitch selection. As many of his Yankees teammates started featuring more breaking pitches, so did Gray, throwing his curveball 25 percent of the time, after several years in the 13 percent range. In theory, that’s a solid idea. Gray’s curveball spin is in the 90th percentile, and he told The Athletic earlier this year that he’s always considered the breaking ball his best pitch. In practice, it worked, too. Gray’s curveball was good, allowing only a .232 average and a .341 slugging percentage, while his four-seamer was lit up to the tune of a .339 average and a .554 slugging percentage. So while there was definitely a change in pitch selection, it doesn’t seem to be the problem. Nor, as Yankees fans like to suggest, was it about Gray’s catcher. It’s true that he had a 12.96 ERA throwing to Gary Sanchez and a 4.54 ERA throwing to Austin Romine. It’s also true that that does not mean anything, because Gray threw only 8 1/3 innings to Sanchez, mostly early in the year. It’s not about strikeouts. Gray’s 21.1 percent whiff rate was just about exactly his career average of 20.9. It’s a little about walks, though a 9.8 percent rate isn’t that much higher than his career 8.2. His 50 percent ground-ball rate is only slightly below his 53.3 percent career average. His 39.3 percent hard-hit rate is only slightly higher than his 38.6 career average (since Statcast™ began tracking in 2015). That is the largest split of the 134 pitchers who faced at least 200 batters both at home and on the road last year. It’s so big that two of the three names directly behind him, Chad Bettis and German Marquez, are Rockies, and you’d expect pitchers who call Coors Field home to have dramatic splits. In Gray’s brief time with the Yankees in 2017, it was the same thing: 5.65 ERA at home, 2.21 on the road. Now, you’re probably thinking this is about the short porch at Yankee Stadium, that Gray is simply ill-suited to pitch in such a notoriously hitter-friendly park. That might be the case, but it’s not because fly balls that would have been outs elsewhere are drifting over the fence at Yankee Stadium. It’s because ever since Gray was traded to the Bronx, he’s been objectively worse in pinstripes, and it’s not just about where the ball goes. It’s not just about home runs, though Gray has allowed 19 at home with the Yankees and just six on the road. It’s everything. It’s more strikeouts and fewer walks on the road. It’s more grounders and less hard-hard hit balls on the road. Perhaps he’s conscious of the short porch, or perhaps it’s something else. But it’s something, and something that didn’t exist when Gray was with Oakland. In his A’s career, he had a 3.50 home ERA, and a similar 3.33 mark on the road. At his best, Gray is a league-average strikeout pitcher who collects more than his share of ground balls, a valuable combination in today’s power-happy, fly-ball game. That held true even in what was a poor year for him in 2018. There were 140 pitchers who threw 100 innings in 2018, and only five of them managed to be part of the 50/20 Club, which is a 50 percent ground-ball rate paired with a 20 percent strikeout rate. It’s an impressive list. Nola is a finalist for the National League Cy Young Award and Buehler is a finalist for the NL Rookie of the Year Award. That’s not to say that Gray was as good as Nola or Buehler. He didn’t have the same strikeout numbers, but there’s still a lot to like. Looking at the Steamer projection system, Gray’s 2019 numbers show that of a league-average pitcher — a 4.13 ERA — though it certainly seems like the location of his future home park is going to affect that. We haven’t really identified a primary cause of Gray’s Yankee Stadium troubles, but perhaps Cashman’s words have done it for us. We aren’t going to play amateur psychiatrist and neither should you, but it’s difficult not to think of Ed Whitson, A.J. Burnett, Carl Pavano and other talented pitchers who could just never figure it out in pinstripes. If that’s the case, there won’t be any shortage of teams looking to take a gamble on Gray for the one year and projected $9 million (less any amount the Yanks pay down) he has remaining before free agency. Start with the entire AL West, since the Angels, A’s, Mariners and Rangers (for Jurickson Profar, perhaps?) are all desperate for starting depth. Include the Astros, too, because they may lose Charlie Morton and Dallas Keuchel to free agency. The Astros are the perfect team to help find the best out of a talented-but-inconsistent high-spin starter, and they showed interest in Gray last year. It’s not hard to see contenders like the Brewers, Braves or Phillies wanting to add a veteran to the back of their rotation. It’s not hard to see any number of rebuilding clubs looking for someone to eat innings who could possibly be flipped at the non-waiver Trade Deadline — think the Tigers, Marlins, Giants, White Sox or Padres. The Reds fall in that category too, plus they just hired a new pitching coach in Derek Johnson, who served in the same capacity at Vanderbilt when Gray was there. There’s not an easy answer to explain why Gray struggled so badly in New York, nor is there an obvious reason why he couldn’t be successful elsewhere. The Yankees may not have helped Gray’s trade value by making it so clear they’re moving on, but they won’t have a shortage of suitors.